When I withdrew from the Republican party earlier this year, I knew I wouldn’t be able to vote in the primary election, and I decided to publish recommendations for as many offices on that ballot as I could, to still do my part in the process. These recommendations are from a very traditionally conservative mindset, fiscally and socially, which means more like Russell Kirk and William F. Buckley than like the current neocons or populists, such as Donald Trump, about whom I’m very skeptical. For each candidate, I tried to find and survey their website, social media, YouTube, and any local media mentioning them, such as the Las Vegas Review-Journal. In some cases, I also consulted people who would know more about these candidates and issues than I do, though all final endorsements here are solely my own. I welcome any constructive discussion in the comments. A lot of conservatives are mad at Dean Heller for not supporting a full repeal of Obamacare–I understand that, but I don’t see him as a Trump lackey or as a rabid anti-Trumper. Heller is his own man, who does what he thinks is best for Nevada. I admire that independence. He’s surely done far more good than harm. We should keep him. Scott Hammond is solidly experienced and qualified, to a degree far above anyone else in this race. I enthusiastically endorse him! I’ve mentioned before on this blog how much I like Annette Teijeiro, and I wish she’d run for something more realistic. I know a previous primary win must have emboldened her, but a county commission / city council seat would be a much better fit than these statewide races–please, Ms. Teijeiro, focus and develop your political career on smaller races. I notice that Danny Tarkanian is running for this office as well, so this would be a good time to remind the world that I wouldn’t vote for him for dog catcher. He’s an obnoxious wanna be, and I hope we can all agree to encourage him to disappear from politics. This is another easy one: I’ve always liked Crescent Hardy, and there’s no one else in this race with anywhere near his credentials–certainly, none of his opponents stands a chance of beating either Spearman or Horsford in the general election, so he’s our man. Nevada had always been a magnet for kooks. Misfits, outcasts, miscreants, mavericks–the malcontents, the fantasists, the seekers of shortcuts. Born of mining boom and bust, the economy was founded on vice: prizefighting, loose women, drunkenness, gambling, and marital fecklessness. Even before going it alone, the state was an outlier, making it all too easy to get married, easier still to divorce. Alcohol was plied twenty-four hours a day. A lenient relationship to prostitution well predated the era in which Savannah was able to earn an accredited community college degree in stimulation therapy. Real cigarettes–or giant, smelly cigars. for that matter–were legal in casinos. A prohibition against state income tax was enshrined in its constitution. In 2042, Nevadans had merely formalized that they were a people apart. In a classic fifth season episode of The Simpsons, we see brief glimpses of conventions held by the two major political parties. The Republican convention is a scene of unmitigated evil. The Democratic convention is shown as a bunch of goofy losers who can’t do anything right. If those stereotypes held true, then Nevada’s Republican caucus last weekend must have been organized by Democrats. Actually, that’s the best explanation I can think of: our caucus was so disorganized, so poorly advertised, and so confusing because our political opponents sabotaged it somehow! Ron Paul Protest Vote in Nevada Caucus? Mitt Romney will win. It won’t even be close–he won 51% of the vote here in the 2008 caucus. Like a lot of conservatives, I’m a little torn between Romney and Paul. But since it’s a sure thing that Romney will win here, what if we all decided to vote for Ron Paul just to send a message to Romney? A strong second place showing here for Paul would tell Romney that we’re serious about cutting government size and spending, and that liberal overuse of the military–by both parties–needs to be kept in check. Could this backfire and actually make Paul win? Not likely. How many people will actually see this and respond to it in the next few days? Besides, even if Paul did win here, Romney would still be by far the most successful candidate nationwide–the nomination’s as good as his. Like him or not, we all just need to prepare to vote for him in November. But if we give Ron Paul a strong showing on Saturday, perhaps we could help ensure that Romney governs more conservatively. Here are two photos from my family’s campout this week at Mt. Charleston’s Hilltop campground. 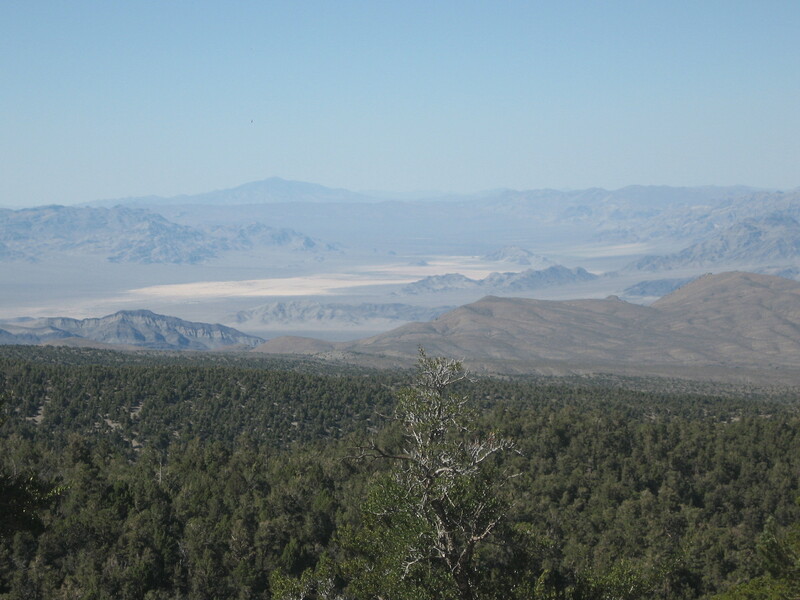 Looking southeast from Mt. Charleston's Hilltop campground, into the Las Vegas valley. 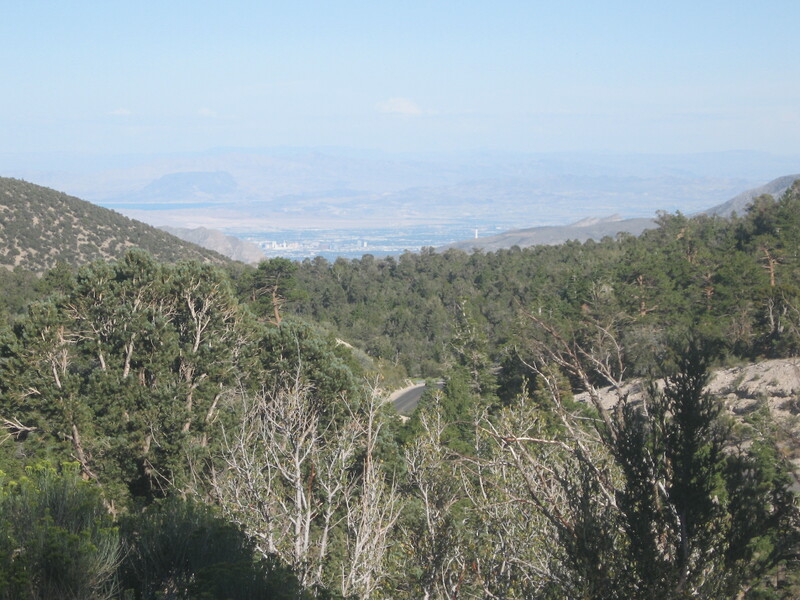 Las Vegas sits at around 2000 feet above sea level; this campground, 8400 feet. To help visualize the distances here, see that little white line sticking up from the valley on the right? That’s the Stratosphere Tower. It’s 1149 feet tall. I tried to get a shot of this view at night, with a mostly full moon hanging over the city lights, but my camera isn’t strong enough. Last December I was in a church meeting and had an idea: I knew what I thought the biggest factor was in our problems with education as institution around here, but nobody was talking about it. Nevada’s huge divorce rate (and, based on informal observation, cohabitation rate), was creating a poor environment for learning. Awareness needed to be raised. So in my spare time I worked on a letter asking local leaders to familiarize themselves with the problem and address it. A week and a half ago it was finished and I sent it out. I included excerpts from summaries of dozens of studies that backed up the obvious–family structure is a major factor in educational success. But so far, zero response. I’m not sure what I expected. Is it asking too much that a city in an academic disaster take seriously a critical but neglected cause of that problem? I suppose the budget crisis is more glamorous to report on, and my issue can’t compete with the political drama these days. Here’s the letter I sent, along with the 25 recipients, who maybe just haven’t gotten around to it, yet. Maybe I need to take more of a grassroots approach. Right now, I’m just sorry I spent half of my personal allowance for the month on postage for this! Education in Nevada is unacceptably unsuccessful. We are near or in last place for student proficiency, achievement, and graduation rates. Recent budget problems have many worried that things may get even worse. Our children’s future is in a state of emergency. There has been much sound and fury of late from well-meaning Nevadans regarding Governor Sandoval’s proposed budget cuts to education, but in their zeal they may have set up a tragedy. Many of my fellow teachers and parents have been saying that these budget cuts would prove disastrous to education in Nevada. Dire predictions of doom and gloom abound that, should the budget cuts materialize, Nevada students would be condemned to eternal ignorance. Perhaps they’re exaggerating to emphasize their point, but can’t these academic Jeremiahs see the danger of their hyperbole? If these budget cuts do pass, what message has this community now sent to our students? Might young people pick up on the idea that their fate has been sealed, and that further effort is hopeless? Might the economic situation, at the very least, be used by some as an excuse for failure? Lobbying for schools is noble, but hopefully the fatalism so prominent in this conversation won’t turn into a self-fulfilling prophecy. Question #1: Shall the Nevada Constitution be amended to provide for the appointment of Supreme Court justices and District Court judges by the Governor for their initial terms from lists of candidates nominated by the Commission on Judicial Selection, with subsequent retention of those justices and judges after independent performance evaluations and voter approval? A lot of conservatives are supporting this one, and I completely see their point: voters tend to put stupid people in office. Case in point: Elizabeth Halverson. Having judges temporarily appointed would solve that. But here’s why I oppose it. First, just because the people are not doing their research and getting involved is no reason to take away their authority to choose their judges. We should never, ever give away any of our autonomy. Agreeing with the mindset that elites should take care of us can only lead to tyranny. Second, though there are areas in American politics where some leaders are chosen for us by other leaders (and before the seventeenth amendment, there used to be more), in those cases the latter were elected with the understanding that they would choose the former. Such would not be the case here, where a committee of lawyers and other yahoos would have that power, but would not be picked by us for that purpose. Third, how does this guarantee there won’t be incompetence or corruption? Unless this new selection committee is headed by Elliott Ness, they’ll be susceptible to mistakes and worse. No, Nevada, do not give up your power to choose your judges. Question #2: Shall the Nevada Constitution be amended to allow for the establishment of an intermediate appellate court, that would have jurisdiction over appeals of certain civil and criminal cases arising from the district courts?